He is just 33 years of age and was on the heavier side at 87 kgs. Like most people, he was conscious he was on the heavier side and had to do something but, never did anything. It was the same usual story of no time to follow a daily regime. He had no daily exercise regime and not so very good eating habits either. But, one chance encounter with a fitness band on a shopping website and things turned around for him. 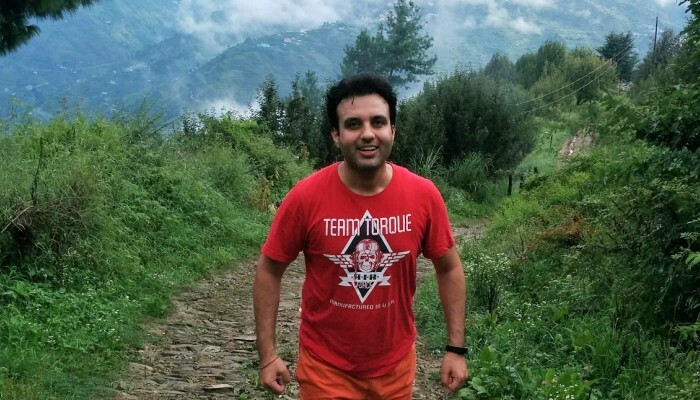 Let us hear from Tarun Chadha how from being a couch potato he is now walking his way towards fitness. While I was randomly browsing the net I came across GOQii.I just read few things about it and the reviews and decided to buy it. However, I had no specific agenda nor did I give it much of a thought as to what am I going to do with it once I get GOQii? It was a random buy. Prior to buying GOQii, I was extremely unhealthy. I had no exercise regime nor did I eat healthy. I had no plan to follow a healthy lifestyle either, I nevertheless bought the band. And, I set a goal for myself for the first time- to reduce weight to about 79 kg in about 6 months. Thereafter, I had a call from my coach Dimple Dua. We had a brief chat and she explained a few things but, I was not very serious initially. But, on the second day when she called me again, I heard her out completely and I was quiet impressed that she had gone through all my details and had taken the pain to chalk out a healthy regime for me that included exercise and nutrition. I realized the effort my coach had put in for me. I decided to follow her recommendations. 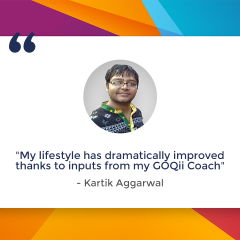 And, am I glad to say that post availing GOQii services my whole lifestyle has changed for good, there has been a total transformation towards a healthy life. Now my routine includes a daily exercise (Walking 10000 steps and yoga), completely controlled eating habits resulting in a reduced weight of 83 kg within three weeks of being on GOQii. 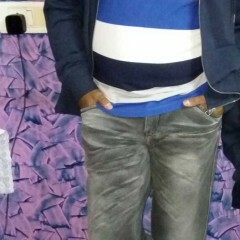 Now, within 5 months I am at 79 kgs thereby have achieved my first goal along with a better mind and body. Overall, I feel good about myself. All the small changes that I have made has had a positive impact on me. I completely credit my GOQii coach for bringing about this change in me. She has been a good listener and has been able to understand my routine, my schedule and has accordingly helped me to adapt change. In my last 33 years of life no one else has motivated me to be healthy as she has done. She has been prompt in responding appropriately and possesses great knowledge in her domain. People around me have been surprised with the changes they see in me. They find me positive. Personally, too positive outlook towards life is really helping me in terms of my appropriate relationship with everyone, be more productive at work and it has made me happy in life.My wife and other family members have also seen the change and been impressed. In fact, my wife has already enrolled into GOQIi and she also has Dimple as her coach. What does coach Dimple Dua have to say about her player Tarun Chadha? Tarun Chadha has been a dedicated player and is enrolled with GOQii for the last 5 months. Before, engaging with GOQii his weight was 87kg and wanted to lose weight to 79kgs.Tarun belongs to a north Indian family where alcohol and Punjabi tadkas is very common. Tarun, initially had no daily exercise routine and his eating habits were bad too. He ignored many crucial eating habits in his daily meals. But,ever since on GOQii, he is very dedicated and disciplined. He updates his daily logs and keeps me informed on everything he does. He is always ready to take up the challenges I give him. We decided to make a transformation towards a healthy life. 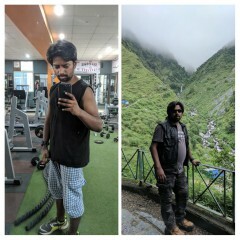 Now, his routine includes a daily exercise (Walking for about 25minutes with high intensity,daily clocking 10000 steps and yoga), completely controlled eating habits including healthy meals, controlled meal portion size and also reduced alcohol which has helped him control his fatty liver condition which in turn has helped him reduced his weight from 87kg to 83kg in just 20days and 79 kgs within 3 months. 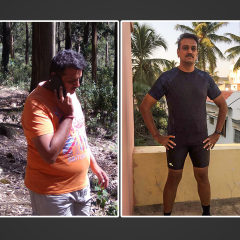 Tarun is now motivated to work towards leading a better and healthy lifestyle.